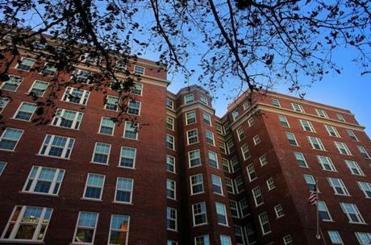 Last year, Boston University completed renovations on Myles Standish Hall, a former hotel in Kenmore Square that has been converted into a student residence. Last year, Boston University completed renovations on Myles Standish Hall, a former hotel in Kenmore Square that has been converted into a student residence. To meet building code requirements, the windows needed to be openable. Worried about students falling or jumping through them, the school insisted that the architects find a solution that would make such a scenario impossible. The result is a building with windows that open at the top, angling to create an opening that lets the air in. It’s a common solution to a widespread fear. “I haven’t worked on a [campus residence] where the windows open more than 4 inches,” says Lisa Ferreira, student practice lead at the Boston firm Goody Clancy, of her 15 years working on campus projects. Boston-area campuses abound with elegant historical structures, and with flashy new ones by big-name architects. When a university needs a new building, the school might hold public consultations, bringing in community members to weigh in on how the proposed design looks and whether it meets their needs. But behind closed doors, a separate discussion is taking place, one that’s focused on potential hazards to a building’s occupants. Call it a secret architecture of safety. Despite an epidemic of school shootings that has shattered perceptions of high schools and even elementary schools as safe spaces, and despite very public discussions of sexual violence on college campuses, it is the unpredictable, everyday adventures of students that have traditionally shaped design decisions on campus. Universities’ concerns are shaped by experience, and much of that experience involves accidents, mishaps, and misuse. But changing ideas about what safety means and how far a school’s responsibility extends are filtering into the conversations between administrators and architects that shape the spaces where students live and work. Jefferson Poole, another Goody Clancy architect, says, “I’ve been literally asked the question: What do you do to make [a building] safe in the case of an active shooter?” It’s a difficult task to manage those kinds of very real concerns and still have a campus that meets a university’s wider goals — to create an environment that is open, welcoming, and conducive to student learning. For every possibly apocryphal tale — like the story of a group of floormates regularly turning a residence shower room in the Canadian province of New Brunswick into an improvised hot tub — there are others that are not. Put a hanging light in a campus building, and students will swing from it. They’ll dangle out of windows, throw things off rooftops, break fixtures, and flood bathrooms. Some stories end without incident, but not all. In 2017, MIT graduate Nicholas Paggi died in a fall while climbing one of the campus buildings. In response, a range of adjustments and modifications to building codes — from avoiding outside balconies, to choosing sturdy, ceiling-mounted light fixtures — have come to define the inner workings of university buildings. “I would say [safety is] always a primary goal when you’re talking about the vision for the project. Higher-education clients take their responsibility pretty seriously — these are young adults but, still, people’s children,” says Ferreira. When, for example, Red Deer College in Alberta, Canada, decides that the guardrails in the atrium of a new residence building need to be 7 1/2 inches higher than code, it’s not just about making sure a student doesn’t accidently fall. “I think for most universities there’s a real concern about mitigating suicide risk wherever possible,” says Carey Van der Zalm of Manasc Isaac Architects, the Edmonton firm in charge of the project. In addition to the higher railings, there are no coat hooks on the back of dorm room doors, and a proposed tree-like feature that adorns a meditation room was redesigned to be unclimbable. There is something existential in the approach these schools are taking to the shape of their buildings — rare and unpredictable events like suicide carry emotional weight that turns them into ever-present dangers. As the number and severity of possible threats has increased, safety concerns have come to the forefront of even the most aesthetically driven design projects — complicating the discussions that architects have with their clients. Ferreira describes clients marking up drawings with detailed security measures, including the exact specifications for the security cameras they plan to use. The role the architects are asked to take, or take on for themselves, often depends on events that are of particular concern to an institution. Ferreira recalls being asked, in one case, to avoid isolating bathrooms from other areas — the school wanted to make it harder for a student with an eating disorder to hide purging behavior. By making sure a bathroom is in a more heavily trafficked spot, they argued, they had a better chance of getting help to that student. There is a difference between working in an environment where large-scale violence feels distant and working with clients in Virginia, where the effects of the 2007 Virginia Tech shooting, in which 33 people died, still linger. College campuses abound with flashy structures by big-name architects. But behind closed doors, a separate discussion is taking place — one that’s focused on potential hazards to a building’s occupants. Universities’ concerns are shaped by experience, and much of that experience involves accidents, mishaps, and misuse. The push for increased attention to safety is coming from a number of directions. Universities, for one, have become more proactive in assessing the safety of their environments. 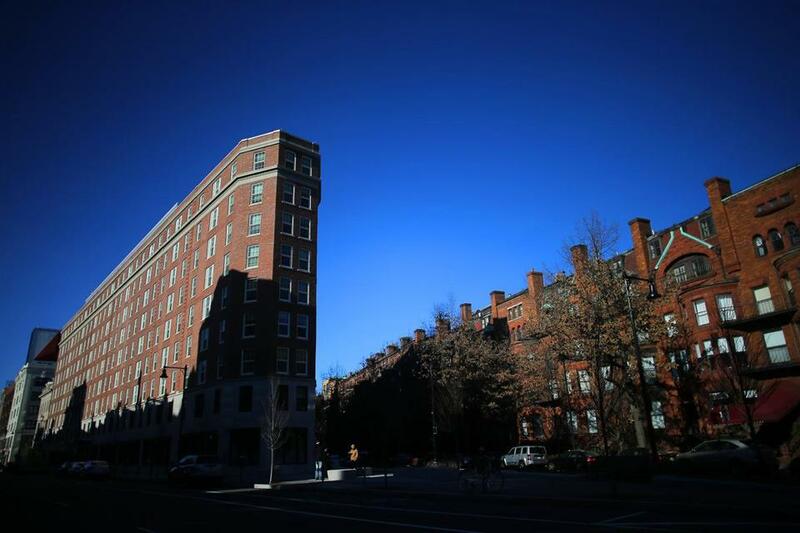 Harvard, currently in the midst of a multiyear renovation project involving 12 historic residences, included safety consultants in their discussions of the buildings’ designs. There’s also the question of liability. “The worst-case scenario is also a very expensive scenario,” says Rory Gawler, general manager of the Dartmouth College Outing Club, who is active in the student-led building projects that are one of the hallmarks of the school’s outdoor programing. In August, the American Institute of Architects issued a statement declaring that architects have not just the ability, but the duty, to create schools that are safe and secure. Jim Brewer, who as the institute’s chief lobbyist has been a key part of the discussion, connects this focus not simply to tragedies like the Sandy Hook shooting, but to a wider, post-9/11 shift to a securitization of space. While her discussion with Harvard focused more on community culture than surveillance, making parts of the building that were closed off visible to the students roaming its halls serves a safety function. Indeed, Merle Bicknell, assistant dean of physical resources at Harvard, makes the point that, if locks and alarms are physical tools to make a building secure, intangible human interventions such as observation are tools as well. “If there’s a sense of shared responsibility for the space and the people in it, you’re likely to have good outcomes,” says Poole. Design is not the solution to violence, or a safeguard against recklessness. But it is a tool increasingly called upon to fill in gaps in services — to protect institutions as well their students. Ruth Jones is the co-editor-in-chief of the independent architecture publication The Site Magazine. She is currently a Munk Fellow in Global Journalism at the University of Toronto.